"Me thinks ye protest too much" Binoy, just as those who eulogise Steve to the extreme. Australians will realise soon that Steve did have 'feet of clay' just as we all do, but at the moment, the greater majority are able to empathise with Terri his wife, now a widow with two young children. There is nothing disimilar with Steve's death as with the deaths of many young people from car accidents, fishing expeditions gone wrong, extreme sports, even misadventure with alcahol and drugs. Australians like to allow a suitable time of remembering the good a person has contributed into the world. It helps us deal with the fact of our mortality. PETA and Greer have broken this convention to promote their own campaigns. We've heard the justification of things like that before, "It's better for one man to die than for the whole nation to suffer". Don't forget Binoy, you have to die one day and those who will mourn you will want a suitable time of comforting before they realistically assess whether you measure up to "whatsoever you do to the least of my people, you do unto me". Give it a rest. If it weren't for people like Steve Irwin people like you would be crying that most of the world's native wildlife is gone. A lot of big words , but what is it you have done for animals? what have you done for conservation? what is your importance? The Irwin family have done more than help wildlife, they educate the world, what did you do? aggravated? Yes,for their own good. Still this is done all the time. Steve chose not to endanger crocs by drugging. Was he entertaining you bet. Was he sincere, yes. I never saw him antagonise any animal. He never tried to say a croc was cuddley or a snake friendly. He just tried to point out they were God creatures deserving of maintaining their habitat. PETA thinks nothing of exploiting naked women in their "I would rather go bare ads" I bet not one wild animal has been saved as a result. What about the shelter animals they killed recently? Steve has nothing to be ashamed of I can not say the same about PETA,you or Germaine Greer. Steve Irwin Will be remembered as the wonderful man he was. A handful of ill advised people can not change his legacy. Picking on a dead man, that is as low as it gets. Obviously Steve Irwin loved and respected animals. Even if you don't agree with how he showed his caring, don't you think it's time for you and your friend Greer to find something else to champion? Stop attempting to soil the name of people who cannot defend themselves. If this issue was that important to you, you'd have addressed it while Irwin was alive with the same tenacity you show now. At the bottom of your article on Steve Irin it says you are a scholar. What exactly is your background?? Is it in conservation, biology, ecology, data sampling of endangered species?? If you have nothing more to do than trash someone as dedicated as Mr. Irwin, who knew that to get humans to want to get active to same wildlife then you must make it accessable to them, by ambassadors of said wildlife. It is unfortunate that humans need that to protect wildlife but the nature of humans makes it necessary to have such ambassador animals. Just as scholars talk of the horrors of war, you continue to enjoy the freedom that soldiers, who are ambassadors of our freedom, lay their freedoms and lives on the line to ensure freedom for the rest of us in the world of democracy. These animals are ambassadors for their kind to the human world, loosing their freedoms in order to save their species. SO... before you trash Mr. Irwin for living his passion to save wildlife, do something besides run your mouth about a man with more morals and values than you have words of negativity. Yes it's true zoos keep animals in captivity. But, Steve Irwin used his celebrity and knowledge to educate the world about animals, to help end animal cruelty. He and Terri both gave their fortune back to conservation choosing to put it to good use instead of living the high life. Steve was a true animal lover in every sense of the word. What I see is a writer trying to get his fifteen minutes of fame by capitalizing on the death of a well known and well loved human being. If your such an animal activist I challenge you to give your life savings to save the animals, then and only then will the world be willing to listen to you close minded and one sided opinion. What a terrific job you have! You can say whatever you want about anybody! I t doesn’t matter if a they’re alive or dead, preferably dead, that way they can’t defend themselves and the beautiful thing is, you don’t even have to know what you’re talking about! Dude, your job is awesome! All you have to have is an opinion, ‘doesn’t matter if it’s well researched, factual, or even accurate. You just write some mindless dribble…infuriate a few people… it’s all good! You are my new hero! I can honestly say the world is a better place because of you! O.k. o.k. I know. That was factually incorrect mindless dribble. It’s just that… I wanted to see how well I could do your job! You speak in tongues--the words you write that may impress your other stoic academics mean nothing to the thousands upon thousands of real people who have learned so much from Steve and his family. You have no compassion for his grieving loved ones and in this you have proven your lack of a soul. The WORLD is grieving for a wonderful compassionate human who became a part of their lives and showed them a PASSION that was TRUE and HONEST. The WORLD WINS Mr Binoy--you lose!!! And we pity you!! Education is at the heart Conservation Biology because people will only make an effort to save wildlife only if they know that it exists. Steve Irwin was a brilliant Conservation Biologist because he let us touch, look, smell, and experience all that Nature can offer through TV. Through his interaction and journey, he made us become part of wildlife experience, so that we can come to love the wildlife the way he enjoys. As a consequence of our love, we become a force in Conservation Biology. Also, Binoy fails to recognize that zoo serves as an important vehicle for Conservation Biology at species and genetic level. Zoo makes rather insignificant contribution to "a loss of sanctuary" these days. Instead, zoo is an important educational ground for youth to learn about the existance of wildlife and perhaps only mode of direct interaction youth can have with the animal. Could you not have published this before Steve Irwin's death to give him a chance to respond, or at least have waited until after his memorial service tomorrow? I am no Irwin devotee, but I was taught not to speak ill of the dead, so it amazes me how many people feel it is quite OK to do so. I find your labelling Irwin as a 'zookeeper' and quoting Germaine Greer's vitriol in support of your case extremely offensive and undignified, especially in a supposedly Christian journal. I was taught that Jesus preached compassion and love and that to be a Christian meant to emulate that compassion and love. Steve Irwin did just that. His love and his sincere compassion for all animals prompted him to spend his life trying to understand them and to educate people about them so that both animals and people could survive together in this world. His joy touched and brought joy to the hearts of millions. Steve Irwin truly lived the principles of Jesus, while writers like Mr. Kampmark so clearly display the Pharisaic characteristics of hypocrisy and arrogance of which Jesus was so critical.Who lives the better life: one who brings joy and love to the world or one who brings condemnation and sourness? Everyone is entitled to their opinion as you are, but to mention Steve Irwin and PETA in the same article is very poor form. PETA is a terrorist organization bent on the complete eradication of all interaction between humans and animals. They do not like animal testing, hunting, pet ownership, or zoos. They are being reviewed by law enforcement agencies on a regular basis. What's more is that they kill more animals (dogs and cats) at their shelters then any other group. PETA is concerned about their egos and nothing else. Steve Irwin, while he did not always exercise the best judgment, was concerned for the animals and their environments. In our world today that thrives off of Extreme Sports and Reality TV, how much attention would Mr. Irwin have attracted if he were to sit quietly by a river and film reptiles from afar? Very Little! I raise reptiles and have been a fan of Steve Irwin’s since he first appeared on Animal Planet, I have been to many zoos and aquariums, and I do not feel any shame at the treatment of the animals I have seen. If you see something offensive or abusive, report it. It stands to reason that the dominant species in an area or planet will dictate what the others do. This is not moral or fair but reality. What identifies who we are is what we do with this power. If we abuse it like PETA, we will fail as the general public likes pets and is against killing people. If we act like Steve Irwin by showing compassion and caring for the natural world, our friends will remember us. How many people will care when PETA closes up shop? Your article is well written from a structural point of view but your content is poor and misguided. You have a very extensive vocabulary but your ideas lack any credibility. So you say that "Steve Irwin preached the wrong message"!!! Well this is a response from the southern end of India. We never bothered about conservation till we came across Steve's show on Animal planet. Children talk about conservation and nature now.They care more about animals now.They hold campaigns to clean up the environment in India.I would say people like Steve and Terri contributed a lot to this awareness.Thats why my friend we are dedicating a Crocodile Park, thosands of miles away from Austarlia, in Steve's memory.As for the people who think Steve spread the wrong message all I can say is "What a shame!". Do you really need this cheap popularity? Clearly people feel strongly about Steve Irwin, and he will be missed by many people. At Eureka Street, we respect and value people's opinions. I would like to remind people commenting on this article, though, to not make it personally abusive towards Binoy. He is entitled to his opinion. Otherwise, we welcome your comments. While it is true that there is an ugly side to keeping animal in captivity, just like there is an ugly side to pretty much anything in life, the majority of zoos have extensive captive propagation programs and are all about conservation. Do you not realize that the habitats of many of these animals is being destroyed? Would you rather your grandchildren and great grandchildren only know of African and Asian Elephants, tigers, giant pandas, gorillas, sea turtles and all the other endangered animals only though photographs rather than being able to see these magnificant creatures in the flesh? If we people do not do all we can to conserve not only the environments that these animals live in but the animals themselves, we are letting not only our future generations down but also these innocent creatures themselves. Think! This article is little more than a poor attempt to follow in anothers footsteps via low-balling to fame. If there is any follow up to this article, I'd like to see something addressing the "large swathe of international scientific and environmental opinion" that has been ignored. Please keep in mind that science is not opinion, but rather fact based. Meaning, evidential proof must be inherent. The window of validity is opened wide when the simple word "opinion" is included. Well, Mr. Kampmark, it seems that the only one who will come to your defense is one of your superiors. Get out from behind that desk and into the real world. Only then will you be able to see the good that Steve Irwin did for the world of animals. As a fellow conservationist and former zookeeper, I was appalled at this article! Steve was clearly in love with life and his interaction with the world around him. We as humans have forgotten what kind of interactions we had with the "wild world" once. We used to live side by side. Steve wanted everyone to know everything they could about animals, and put his life on the line so others wouldn't have to. Zoos now are more than entertainment, they are a space to preserve what has been taken away in the wild. Many of Steve's crocs would have surely died in the habitats left for them, as many of his shows captured him rescuing crocs from horrible situations. He gave them kind homes and let them live as crocs. Staging a rally in which to discourage his children from following in his footsteps? How awful! What message does THAT send? Don't care about the animals? It seems to me that PETA is in it for their sole commercialism. PETA needs to do waaaay more research to see that without many of the things they're against, they might not exist. I agree in the fact that children should be advised to take great care and enjoy wild animals from afar, but that's what parents are for. I encourage everyone interested to take a look at the real facts on how many animal species are being saved by zoos or how many individual animals have had their lives given back to them through zoos. One day, I hope my son will want to follow in his mother's footsteps of conservationism and ignore the uneducated who are in it because someone shouts a loud message. Our hearts should really be sending a message of healing for Terri, Bindi, and Bob, who surely knew the dangers, but are still in deep sorrow over the loss of Steve. If for nothing else, let's allow Steve's memory to be a positive one for them. People all over the world "knew" him and loved him, but was still just a father and dear husband. I don't know anything about this Binoy person but I recognize when someone is trying to capitalize on another person's fame. Steve Irwin did more for wildlife than anyone else can ever proclaim to and yet he did it with modestly and humility. He was passionate about the animals because he truly cared about animals. To try to undermine that is a cheap shot at an inappropriate time. Shame on you. My only wish for you is that you may receive "one percent" of hate mail compared to the thousands of good will wishers and love that has been posted for Steve Irwin and his loving family. I PRAY Steve's wife and children will find it in the loving nature that they have been brought up on , to some day forgive people like you and ignore your ignorance and continue on with the love for our world of animals. I am NOT speaking of the animals on two legs as you! Shame, shame on you. All of the other posts express my sentiments, exactally! Get a life, man. Goes to show that when a person dies, all the jealous people start speaking out. out...then and only then. If it's attention you wanted, you got it. Binoy confine his thoughts to that of academic processes. Best he stop writing pernicious pieces like this. Academics continue to prove themselves irrelevant. Crikey, mate, you sure missed the point. At least Greer make her agruments coherent. Yes, he was a croc botherer but he brought the concepts of conservation and the value of creatures and nature to a new young audience that otherwise would know nothing about them. One equally ignorant writer suggested that young audience should watch David Attenborough - have you tried putting anyone under the age of 18 in front of Dave? I have with my two boys and they are bored rigid. No disrespect to Sir David but he does not grab the attention of young people. Steve Irwin managed that brilliantly and as a result there will be a whole new generation of conservationists. Did you or anybody who works at Eurekastreet bother to read this. Eureka Street is about encouragement. That is to say it is courageous. It is not rashly bold, but it focuses unwaveringly on the human dimensions of individual, communal, political and international situations. This focus is consistent with the mission of the Australian Jesuits, the owner of the Eureka Street masthead. To prize humanity in a world in which economic and consumerist values dominate, is often to be isolated. I wonder if Binoy has ever watched Irwins show on Animal Planet. I also wonder if he has ever visited Australia Zoo. People seem to forget he tried to teach children about animals and conservation. Not big intellectuals. Disappointing article to quote from Germaine Greer's mouth. I challenge Eureka street to produce a real article on the life of Steve Irwin and the wonderful relationship he had with his family and the animals of this planet. In addition, police made a statement clearly stating that Irwin was not provoking the creature in any way on the footage of his death. So throwing up a bunch of maybe he hassled the sting ray comments really smacks of straw clutching. I am sick of so called Scholars like you, Binoy, assuming that Steve Irwin provoked the stingray. I'm sure you will search for the footage of Irwin's death, and relish in the sight of a man dying. But will you, or anyone else who has made such comments, publicly apologise if it is found that this was an unprovoked accident? How dare you to mention PETA in the same sentence as Irwin!Do your research! Go to petakillsanimals.com and see for yourself. 24 hours after I post this, Mr Binoy Kampmark, I will have forgotten your name.............for the rest of my life I will remember Steve Irwin, not the entertainer, but the genuine, passionate, loving man. I dont think you have much of a heart when it comes to you, teasing someone, who was a great aussie icon. Sorry to Terry Bindy family and Friends. i am sorry to hear about steve irwin's death. i offer my condolences to terri and steve's little daughter and son. i fell sorry for them,having parted from a really good and admired father and husband. steve irwin was a really good person,he cared for wild and dangerous animals.and his goal was to protect and educate the world about them. he died doing what he loved and he died doing something for his young daughter. he would be remembered and steve irwin's family and friends have my surport...may God bless u and keep u all safe.steve irwin was a good, compassionate and loving man. Yes Mr. Kampmark is entitled to his opinion but he should get his facts straight before you publish them. Secondly I find it interesting that this site is so willing to jump to his defense. If he or you could not handle the backlash that and ill conceived article like this would create then you should get out of the business. Binoy wanted to give the world his opinion and now he's got ours. Sorry if it hurts his feelings but give me a break, why shouldn't he be attacked personally...he and you had no problems publishing an article that personally attacks someone who spent his life trying to change the world for the better. To Terri, Bindi and Bob...the world morns with you and we are so sorry for your loss. He will be truely missed. Don't let facts get in the way of a good story. Steve Irwin died at Batt Reef off Port Douglas NOT as you indicate (Gladstone). Until you can get your facts straight I don't think anyone will take you seriously and that's MY opinion! I don't understand what people get out of writing articles like this other than... It's all for attention...to provoke a fight. It's so obvious. How can you say that this man was not genuine in his concern and love for animals. You obviously are not an animal lover. This man was so genuinely fascinated with every animal he encountered, so in awe of them. He was so passionate about doing the best for them. You know, it's really not even worth the time addressing this article...it's ridiculous. Grow up and quit trying to take advantage of a good man's death to further your meager career. and i can`t stop he was so cool. Binoy Kampmark and Eureka Street had no problems publishing an article that personally attacks Steve Irwin so why should we be delicate toward Mr Kampmark's feelings? All too often the intelligentsia have their "Opinions" published in preference to any substantial understanding of the man, the zoo and the crocs! Irwin's magic was cast primarily over the children of the United States. But unlike the billionaires Wiggles pushing countless mind numbing songs and DVD's, Irwin's Crocodile Hunter program was aimed at Irwin's personal philosophy on teaching children. Enthusiasm and passion equals interest. Two interesting pieces of information. ONE: Irwin's show was responsible for almost 10 million additional subscribers to America's Animal Planet cable TV channel. The network was struggling for survival until The Crocodile Hunter began airing. TWO: Germain Greer is a spokesperson for the BORN FREE foundation which is under investigation for lost millions in funds. She is a long time friend of Joy Adamson the woman of Born Free fame. Irwin's conservation program on the other hand puts every cent back into wild life. I honestly do not know all the facts on this one, but sure sheds some light on Greer's "Opinion"
What a load of rubbish. The author obviously doesn't know Steve Irwin. As for the opinions of Germaine Greer, who could really give a damn. What has she done recently. If we all had a small portion of Steve Irwins passion for life the world would be a much happier place. He was never an antoganist of animals, but a saviour. The world will be a lesser place without him in it, and I am sure that Terri, Bindi and Bob will be feeling it more than the other 300million people grieving today. I have one question for the author?? 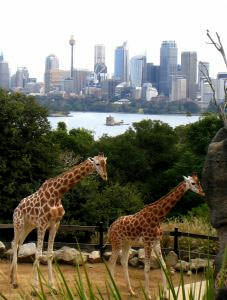 Have you been to Australia Zoo?? Although its not completely possible to recreate the wild the Australia Zoo does a dman good job. Why must you berate someone who ok his methods might not be to your taste, but someone who genuinely loved widlife. Ask a kid if they want to do harm to these animals and you'll egt a resounding No. You say just leave the animals alone, if there is not people like him to educate and show us these creatures then their habitats will jus get smaller and snaller. I wish I could say I was surprised by this sort of ignorance, but I can't. PETA is a classic example of a good idea turned bad by a few lunatics who don't see beyond the immediate picture. I seem unusual among animal welfare enthusiasts in that I consider properly run and well-planned zoos to be not only a good thing, but necessary. The numbers of so many species of wild animals are plummeting, and in protected environments like zoos and safari parks, they can have a safe place to live their lives out in near-natural conditions, and breed to their hearts' content. No, it's not the same as being wild, but given that most animals who now live in zoos were born in captivity, they don't suffer emotionally because as far as they're concerned, this is how life is for every member of their species. Then there are the ones who were captured, like Steve's crocs, or the apes who live at Monkey World, who were confiscated from the pet trade. In their case, the alternatives were death (the crocs), or ridiculously restrictive lives spent in people's homes, until inadequate health care results in premature demise (the apes). I loath archaic zoos with cramped, badly-designed enclosures and clueless keepers as much as the next person, but if a safer version of nature can be produced in captivity, why not? In a perfect world, zoos wouldn't be necessary as wild habitats would be safe and plentiful, but as five minutes of watching the news will tell anyone, this is far from being a perfect world. Take Monkey Forest, which I visited just the other week. There, 150-odd Barbary Macaques roam freely in 50 acres of woodland. They climb in the trees and sleep in them at night, are fed at regular intervals but also graze on plants and bugs, live in groups as they would in the wild and groom each other, and I counted three little babies and about ten young monkeys, so they must feel happy breeding there. The monkeys literally have the freedom of the park - they walk around as they please, while visiting people are kept to fenced-off paths. The monkeys can walk across your path, but you can't follow them into the grassy areas. There are guides at very regular intervals throughout the park to answer questions and make sure nobody violates any of the rules (in short: no feeding, touching or scaring the monkeys). Would it really be better to let the population of Macaques continue to fall in the wild rather than 'subject' some of their number to this 'abuse'? As for the idea that Steve scared and hurt animals, I think again that that's not seeing the forest for the trees. Of course, no wild animals like to come up close and personal with a human being; they wouldn't last five minutes if they did. I'm sure the crocs Steve captured to fit them with satellite trackers didn't exactly enjoy the experience, but pet cats and dogs don't like being taken to the vet for their vaccinations or to be neutered, either. Both those procedures instil small amounts of stress and pain in the animal, but we do it for the greater good, so that they won't succumb to preventable diseases, or bring young into the world that cannot be provided for. When Steve caputed wild animals to relocate them so they weren't shot by hunters, or fitted trackers that also have the handy side-effect of interfering with telescopic sights on guns, the greater good was served. Of course the animals didn't understand that, but then neither do Fluffy and Fido, and that doesn't stop PETA from advocating neutering, and quite rightly so. How was Steve's work different? Now I've got my logical argument out of the way, I just have one more thing to add - grow up, and come back and criticise when you've achieved half of what Steve did. This article of yours might be true to some extent, knowing that humanity has stepped on the toes of nature is clear. Constant pressure on the environment will dessimate these endangered creatures to the brink of extinction. What Steve has done is bring a new side to each animal he films. He shows the fascinating aspects of these creatures in a way where typical everyday people can wonder and think twice, WOW i didn't know it could do that or OMG thats just so cool. With this effect on people do you think your ideas will get you this far? His whole life was dedicated to animals, he converted me from a shark hater to a shark admirer. Knowing that you have this view of Steve, do you think a pompous scholar like you ever thought of that? Well I tell you this, your opinion might be accepted by .05% of the public. We australians are proud of our eco heroes and the rest of the world should understand that! By the way, Zoo's are there to generate money, and I know for a fact that Steve has used his earnings in making the wild animals remain wild. I've seen steve at his zoo, i've seen how he has changed people to be animal lovers. Your opinion wont shake my foundation and belief in this generous, compassionate and kind hearted man. Steve, you will be missed by more than you'd ever expect. Good on yah mate! You did Australia proud. Sorry, Binoy, I missed your list of contributions you've made to native animal conservation and wildlife. Could you please clarify what they were again? Saving crocodiles already sentenced to death by authorities (Irwin did)? Creating a Koala hospital to save koalas which are being decimated by clamydia, other diseases, and urban expansion (Irwin did)? Creating and relating awareness of the importance of wildlife among children (Irwin did)? Buying huge tracts of land to create wildlife sanctuaries (Irwin did)? Successfully lobbying governments to fund wildlife preservation (Irwin did)? I'm sure it was just an accidental ommission on your part. I want the Irwin family to know they will be in my prayers. Steve was an unusual person ,he loved and cared for Wildlife with a deep passion, he built a safe enviroment for the animals and cared for them like they where his children. "They where his family." It doesn't matter what anyone says in a negative manner about him, when you watch his films you can see in his eyes that he truly believed in what he was doing, not like most that stand there and make it boring, and not educational to young and old. Ever heard the saying we are all different, so are Animals. Steve you did a fantastic job at filming and handling the animals and you saved many from death. I know you will be watching over them from above with your'e Mom at your'e side. God bless you and your'e cause. Terri countinue with your'e family, in Steves dream and passion and never stray. God bless and make you strong for your'e family and the animals. Yes, Steve Irwin did interfer with nature. Yes, wild animals should not be caged in zoos and yes zoos were originally used to display power through entertainment. Perhaps Irwin was giving the wrong message to kids, like wild creatures could be cuddled and kissed. But inspite of these, alot more people will become more aware of wildlife conservation, me included. When an Orang Utan in a zoo was being treated more like a human than an animal, someone complained. Which drew this rejoiner from a young girl, "I agree that we should not treat wild animals like humans, but because I had a chance to get close and see how beautiful and important this animal is, I have decided when I grow up to help conserve them in the wild, it's their world too"
"You must sing for your supper; you must perform for the public." Steve Irwin did not run a circus, his anmials did not have to preform to eat. Binoy should really do a bit of research before he decides to write an article. I find it amazing the amount of has-beens (Germaine Who??) & never-will-be's who have jumped on the "let's kick the man when can no longer respond" bandwagon. Rather then have people like Steve Irwin capture & relocate crocodiles, perhaps they would prefer that we return to the days when crocodiles that entered areas which are frequented by humans would just be shot, either publicly or quietly. Binoy, I don't care what you personnally think of Steve Irwin or his methods of making people care about what happens to some fairly unlovable animals, but I do wonder why you waited until the man was dead, and therefore couldn,t answer your critisms, before voicing them in a public forum. Were you afraid that he could give you answers to your questions and make you appear even stupider thaen you already do? How refreshing it truly is to read such an original and thoughtful article that challenges the popularist and sentimental notions of a society afflicted by the frenzied antics of celebrity. In a departure from the impersonal tributes by khaki-clad network anchors, Mr Kampmark reminds us of the foundations, however questionable, upon which the Irwin entertainment dynasty was built. Does the end justify the means? Steve's zoo was for conservational and education purposes. He started off his career relocating crocodiles in dangerous locations, not entertaining. He loved animals like most people love their families, and it is disgusting that after his death, when he has no means of defending his name, there are people criticizing the work that he so passionately dedicated his life to. Yes, he annoyed animals sometimes. He never intended to harrass or hurt them. His message was purely of conservation. Fear leads to ignorance, which leads to hatred. By curling up with wild animals as if he was one of them, Irwin did not so much set an example as to go do the same, but showed that there is no need to fear wildlife-- respect, yes, but not fear. I hope wherever he is now, Steve Irwin can see his followers, those who respect his conservation efforts. Not the journalists who pick at every aspect of his life that could be interpreted wrongly. Is there any point to Eureka St keeping this article on site? For the hits to the article and site? This article does not hold up to the Jesuit principles this publication is founded upon at all. It is factually wrong, offensive, cruel hearted, pointless academic drivel. Eureka st have displayed terrible editorial judgement on this article and one hope this man's opinion remains in Cambridge. Articles riddled with academic speak and no substance or heart is indicative of elitist news reporting. We realise that there is an enormous volume of criticism for this article. We do not, however, practice censorship by majority vote. While many people do not agree with this piece, that does mean it should be taken down. I for one do not agree with everything that Binoy says, but that does not mean that I cannot allow his argument to be put across. It is in the plurality of voices that the strength of democracy can be found. This plurality extends to people that one does not personally agree with. Steve Irwin did a lot for the environment, and touched many people's lives. HE was brave, courageous, joyful...as many of the abusive posts that have not been approved were not. I beg your pardon but since when did the Jesuit's undertake to disregaurd any of the 10 commandments....shall I remind you that "thou shalt not bear false witness" and the parable saying "judge not yet ye be judged" or any of the other biblical teachings that state nobody but God himself is entitled to judge any other living being. Kindly do not quote religious beliefs as a basis to defame the memory of a recently deceased person, I didnt happen to take notice of any such lamb-basting of His Holiness Pope John Paul II when he died, and he too like Steve Irwin preached conserving our world and the lifeforms on it... and no I am not suggesting that Steve Irwin be cannonized for sainthood, I am merely reminding people that it isnt a good idea to demean the memory of somebody who was trying to deliver a message of conservation and preservation. Zoos as centers of animal subjugation? Gladiatorial contest? Put down the thesaurus and get a grip on reality. People have to be interested in something for them to spend money on it. It's just the way the world works. If people are excited about wildlife, they will ultimatly be more inclined to throw money at it. The zoos, which you somehow through the lens of your skewed view of reality portray as cruel prisons, do more for the conservation of wildlife then people such as yourself will ever do. Yet without ever working at a zoo or being a part of wildlife conservation efforts you feel you are qualified to condemn them as prisons of animal captivity. In reality zoos are places that take great care of the animals that reside in them. Giving them well-balenced diets and keeping them at optimal health. Even giving them ideal habitats. The truth is people such as yourself see bars and gates and locked doors and nothing else. Like the animals are in some kind of prison. Unlock the gates on a zoo Binoy and see how long the animals within last. See how healthy they are. The secondary purpose of the zoo would be to educate the public and excite them about animals, which they do. Which is also what Steve Irwin's zoo did. Steve Irwin himself came from a family centered around wild animals. Wrestling crocodiles and handling deadly snakes from his teens. There are no members of PETA in the area of credible animal preservation and conservation. Their biggest achievements consist of spraypainting seals and freeing rats and mice from cosmetic labs. My point is that Steve Irwin was a man who lived his passion. He grew up a guy that you would call to come and wrestle a croc out of your backyard and into a truck. And kept that hands on approach throughout his whole life when it came to wildlife. It got people excited about preserving animals and land that was otherwise considered worthless. He even helped preserve the lands and culture of the Austrailian Aborigines. Even respected wildlife figures that disagreed with his style of getting close to the animals only disagreed with it for his own safety, not for the animal's. Even they still have to admit all he did for conservation. He did more for the world then Greer, PETA, or any other out of touch intellectual elite will ever do. It's always humorous how even when they [elites] are the least qualified to make judgements on a matter, they still feel the need to do it. The public and media certainly have lost perspective. That is the thrust of this article. That is why it could not have been written before Irwin's death. It is (at least in part) about what has been taking place since. The loss of perspective proves what a great man once said: A single death is a tragedy. A thousand deaths is a statistic. Yet another great man said that the world does not cease to be funny when someone dies, anymore than it ceases to be serious when someone laughs. That same man also advised to look for hidden truth behind every joke. There are no hidden truths behind Greer's mockery: the remark about the parrot could only tickle that part of a sadist that finds pleasure in death. She is a mountebank. However, in this article (which neither mocks nor jokes), we could do well to find something of value. It seems most people cannot see it. I guess mournstabating really does cause blindness. Finally, for people who have been inspired to love animals: is this necessarily a good thing? I do not here say Irwin's methods are right or wrong, but regarding the children who want to grow up to be croc hunters: the person who does harm while thinking they are doing good is a far greater menace than the person who is wicked and knows it. We should not make a burlesque of this sorry situation, by dangling meat in front of some poor creature and making it come up for its dinner for our amusement, or even for our "education". When the day comes to take Fido to the vet to be put down, would you make him howl to the tune of "See that my grave is kept clean"? If the public really is humane, it would empty its pockets to fund sanctuaries and so forth without requiring to enter the gates and see these creatures "sing for their supper". Remember that it is not just for the sake of the animal that we should treat it humanely. We treat things humanely because we are human. To treat something (human or beast) in an inhumane way is to be inhumane, that is, less than human. Without zoos I wonder how many people would be reached concerning animal conservation. Like it or not, zoos must be maintained in order to elicit funds to save animals and preserve habitat. 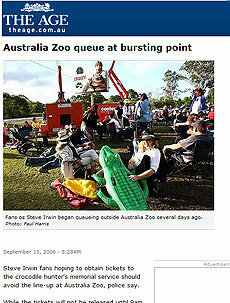 What is hoped is that the zoo will be "animal-friendly" and the Australia zoo certainly was that. Steve worked close-up with animals because he felt this was the way to get people to know the animals in order to protect them and to protect their habitat. This was his mission! And concerning his handling of the crocodiles don't these critics know that he handled them in order to move them from places where they were a danger to humans and in danger of being killed? Who else would attempt to hunt them, catch them, and then move them to a safer place - like the ocean? He did not believe in darting feeling that this was dangerous for cold blooded creatures. So the only recourse was to grab them. fasten their jaws, and then place them in a box and move them to wherever was deemed the best place. He saved over 100 crocodiles - crocodiles that were doomed to more years in tiny cement enclosures, litter-strewn, dirty swamps, or were in people's back yards where they were certain to be shot. How can people criticise this? I know of noone else who has done so much for animals or for the environment. He was a passionate warrior for the animals and I see noone out there who can come even close to matching his knowledge, his consummate skill, or his passion. He will be sorely, sorely missed. I am an ardent Steve Irwin fan, and yet what you say makes sense. I have, even while I loved the man, wondered why he though it was a good idea to " pester " and annoy snakes or other animals just to show them to us. I know how he described his motives for this -- he felt it was important that we get up close to the animals so as to better appreciate their beauty and unique attributes. This is a noble undertaking, but you are right....if we as a society are reduced to requiring that the animals, so to speak, sing for their supper, something isn't right. I feel odd criticizing Steve Irwin..but there you have it. In the balance, I feel he did MUCH good, but things aren't yet perfect in the conservation world. Discouraging Bindi and Bob from following in Steve's footsteps doesn't seem right, either. What seems better is to hope they will be more enlightened and perhaps educate themselves in alternate methods and approaches to conservation. Steve Irwin is a super hero for all wild life and an astonishingly beautiful human being who introduced many to the beauty of the less cute and cuddly members of the animal kingdom. His loss is absolutely tragic, especially for those animals we are taught to fear or revile. It's easy to fall in love with an adorable teddy bear with big dark eyes, not so much for a fang bearing reptile. For PETA to have anything but praise for someone who considered himself a “Wildlife Warrior” is hypocritical. PETA does not truly advocate the ethical treatment of animals as much as they are an anti-human gang of lunatics. A reminder to PETA, humans are also animals. Animal rights organizations deserve respect when the actions they perform are wholly positive and peaceful. However, PETA and other violent animal rights organizations are NOT wildlife warriors, they are wildlife terrorists. And for Kampmark to equate Steve Irwin to the level of a whip carrying lion tamer is foolish, uninformed, unnecessary, and extremely cruel while his family, friends and admirers still mourn his passing. I pity you. The "zoo" started as a wildlife sanctuary. Steve Erwin brought sounded or displaced animals to the "zoo" when they were endangered due to tragedy (usually due to man) and released them back into the wild when they could be. The "shows" were to educate the public on the wonder of nature and the beauty of these creatures. Nothing is perfect, yet in his sincere effort he did educate people and helped endangered species through this education. Should we all be so successful in getting our message across. I do agree that exploiting wild animals is wrong, especially for financial and entertainment purposes, however your statements about Irwin keeping animals in captivity as though they were prisoners is grossly exaggerated. many animals in zoos were obtained because they were injured to were going to be killed because they were causing problems in human developments. Many of these animals would never have survived in the wild, because Nature is not as merciful as some animal rights activists would like to believe. the problem with Steve Irwin's actions is that people today are incredible ignorant, believe they can do anything, and have no respect for any life other than their own. if more people actually educated themselves about the world and animals, we would not have people killing stingrays in "revenge" for Irwin, as though the sting ray population will watch themselves next time they see someone swimming above them. Steve mentioned many times that the animals were dangerous and only eperienced and educated individuals should try to handle them as he did. and Yes, you are right, when everything boils down, Steve was probably earning a profit off of his documenteries and Zoo admission costs, however, EVERYONE in the world must do this to stay alive. at least he was making a living spreading animal awarness and conservation instead of sitting in a corperate office devising ways to scam millions of dollars from regular folks by seeimg how much they can sell gasoline for, or how to get away with dumping waste products into the ocean because its cheaper then being environmentally conceius and that new billion dollar yaght doesn't pay for itself. so yes, write about how stupid people are acting in light of Irwin's death, but there are hundreds of public images that are a hundred times worse for kids to have as their role models, so why aren't you writting about them? I am sickened by the vitriol of some of these comments. Steve Irwin was not a bad man, but he was not a saint either, secular or otherwise. Get a grip people! Assistant editor James Massola states "I would like to remind people commenting on this article, though, to not make it personally abusive towards Binoy". I believe that the author,Binoy, is guilty of some implicit "personal abuse" towards Irwin. Conservation is fine, but the apparent "Disney-fication" which seeks to give all animals human senblilties in the aid of animal rights is just too cute. The spurious anthropormophic qualities given to animals, which seems to involve projecting human and subjective sensibilies and philosophical outlooks (even political ones) into the minds of animals is overly emotive and misplaced regarding modern zoos: to speak of subjugation, to say "you are on show....because you are in captivity, because you are not free, and your ancestors were exterminated. You must sing for your supper; you must perform for the public" seems to be discourse more appropriate for opressed humans. Perhaps the crocs will rise up and say, "Let my people go!" Poor Steve Irwin. Perhaps Mr Kampmak can write a sequel called "Uncle Croc's Cabin" while he is at Cambridge. It appears to me that the responders to this article who find fault with Steve Irwin are elitists who have disengaged themselves from feeling and emotion and for that believe themselves superior beings. How terribly sad for them and all the inferior beings who are forced to live amongst them. Steve Irwin was the most enthusiastic, funniest and most prepeared man i have ever seen on television and his family are just the same. When i heard that Steve Irwin died my heart was shattered with sadness and so many questions one of them were how such a brave person die and leave this world but as he alwasys said `I'll die doing what i love' i have a magazine on my wall with all other ones of the Irwin family saying that. Thank You for letting me say my comment on the Irwin family. Your article really made me think. Generally speaking I think that Irwin has made people aware of the fact that crocodiles and snakes are not only hostile to humans and thus "deserve" to be killed whenever these creatures "dare" to come too close to their dwellings etc. He has shown all the world the beauty of them or at least has made people share his admiration and fascination. But as your article shows the price for this might have been high, and I have never seen it this way. I am a teacher and as Australia is part of the syllabus in English in year 9 we have also discussed Steve Irwin, his work and his tragic death. I will copy your article and give it to my English class for further discussion. You say all of these things that a plainly simply saying that Steve Irwin was a hyocrite, and yet what you refused to mention was that those animals were either born in the zoo or rescued from death. Alligators and crocodiles inhabiting any populated area that grow to be over three feet long are normally killed. Steve Irwin rescued those animals from death, and they were taken very good care of in the zoo. The enclosures were designed to mimic their natural habitat. For those gators it was the zoo death. You also make assumptions that he he 'may have died aggravating an otherwise placid sea creature'. I respect the fact that everyone is open to their own opinions, but to make an assumption like that? He spent his whole life trying to save animals, and it is WRONG to talk about people like that. ESPECIALLY when they are dead and can no longer defend themselves. Steve Irwin was a great man and you try to disrace him with your lies and harsh assumptions. I no longer work in zoos after 20 years. We tried at Healesville Sanctuary to change the face of zoos to visitors viewing natural behaviour sending visitors home with worksheets and ideas to learn to live with wildlife. We had a South Eastern Victoria policy for animal collections to focus funding on our own 16 local endangered species. Steve Irwin's focus on himself rather than the animal welfare changed the world to accept dogged, male focused dominance over issues that are clearly wrong, ie. children in enclosures, exploitation of animals. Where are the keepers who care for the animals day in and day out to tell their stories and the unrealistic image of okka Australian males with their sheila by their side. Reminiscent of our facist National party Queensland Government.